Weichai Heavy Machinery Co., Ltd.
Weichai Heavy Machinery Co., Ltd listed in Shenzhen Stock Exchange in 1998 (Stock referred: Weichai Heavy Machinery, code: SZ000880). Weichai Holding Group Co., Ltd had greatasset restructure to Weichai Heavy Machinery Co., Ltd in 2006, andmerged medium-speed engine, power generation equipment manufacturing and other excellent operating assets, and became the controlling shareholder of the company. The company had the most complete product series, widest power coverage, and widest application domain of marine power and generator set supplier. The company specially developed, manufactured and sold marine power and power generation equipment, and medium-speed and high-speed diesel engines with horsepower from 30 to12, 000, generator sets and integrated power systems; meanwhile, operated diesel engine parts, marine gearbox and other supporting industries. The 6160A medium-speed diesel engine of company accessed national quality silver medal, and total number of 6016A reached 100, 000 units. 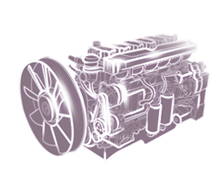 The 170 series of diesel engine which was self-innovated in 1993, had won domestic and international certifications such as China CCS, Korea KR, France BV, Russia RS. The CW200/250 series of diesel engine was based on advanced technology of domestic and international similar engine, and had the high reliability, good fuel economy and convenient to maintenance; Since 2008, the company imported the 27/38 series, 32/40 series, 21/31series and 16/24 series of high-power and medium-speed marine diesel engines from MAN Company, the power range will extend to 12, 000 horsepower continuously. The company will become the only domestic medium-speed engine enterprise with all series of marine power product, and establish completed product system of Weichai Power. The company stablished perfect quality assurance system, and aimed to create famous brand of Weichai with all stuff participate in and improvecontinuously. The company took the lead to pass the ISO9001 quality management system certification. The diesel generator set passed the National Communications dedicated turbine Certification in 2004, and passed the plateau certification of National Quality Supervision and Testing Center of internal combustion engine generator sets and CE certification of Rhine,German in 2005. The company obtained equipment manufacturing qualification, GB/T24001, GB/T28001 environment/occupation health and safety management system certification in 2011, and awarded the honor of “Quality Trustworthy Enterprise”. The company owned excellent supplier resources and global end consumer resources. The company established long-term supply relationship with world leading manufacturers of engine parts such as ELWOOD and WOODWARD to ensure the reliability of products and accessories of powertrain. The company also established long-term cooperation relationship with end customers, such as China Marine Surveillance Corps, China National Offshore Oil Corp., China Changjiang National Shipping (Group) Corporation, to ensure the reliability and long-term of product market. The company more than 300 service stations in the area of domestic ship power business covered the field of Chinese inland, coastal, major islands, river and lake; and formed the all-day and all-area service network of “ Where there Weichai product, there Weichai service”. The company set up more than 100 service stations oversea, and established overseas parts distribution center, formed perfect international service network.